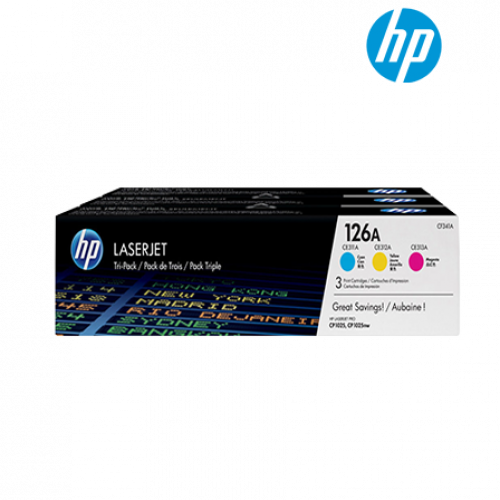 • Original HP Color LaserJet Tri-packs offer a better value than individual cartridges. Print more pages for less with cartridges packaged for high-volume printing. Save on shipping with only one product to order. • Print with confidence – Original HP LaserJet toner cartridges are designed together with HP printers to offer outstanding performance. Make an impact with professional-quality colour documents and images. Rely on HP for free and easy recycling. • Stay productive and worry less about supplies. Minimize shopping trips – buy the cartridges you need for colour printing packaged together instead of individual cartridges. Intuitive design makes replacing cartridges fast and easy. Program availability varies. Original HP cartridge return and recycling is currently available in more than 50 countries, territories and regions in Asia, Europe and North and South America through the HP Planet Partners program. For more information, visit http://www.hp.com/recycle. Declared yield value in accordance with ISO/IEC 19798. Actual yields vary considerably based on images printed and other factors.